Evaluate Your Performance for Growth in Happiness. Today is 9th birthday of my online work. Same day on 19th Jan. 2008, I started my online work. So, today, I want to give gift to you. So, I have made this video. This video will teach you the step by step process of creating happy moments. This video is 1 hour and 12 minutes. 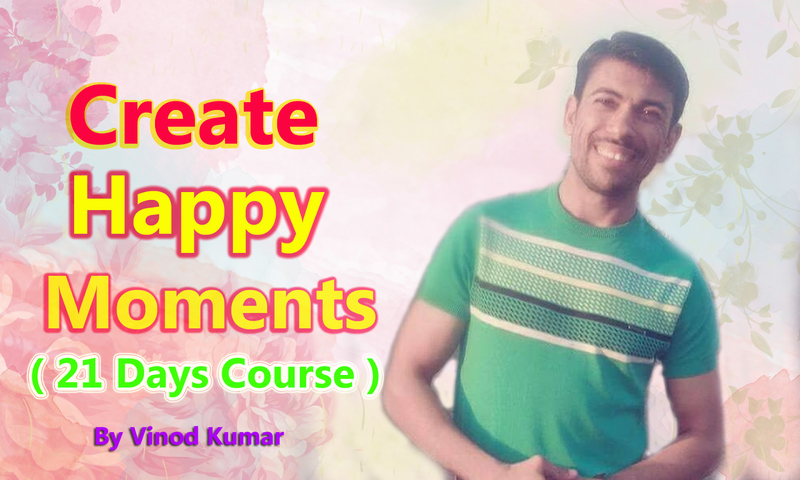 In this lecture, I have explained 21 days course for life time creation of happy moments. Every day, you have to create some part of happy moments. In the end of 21st day, you will able to create the happy moments. 1) Make the list of things you are thankful for. Given by god or people. Read it. 2) Make the list of your achievements. Note down even smallest achievements. Read it. 3) Make the list of your dreams and goals. Read it. 4) Make the list of skills you want to learn. Learn essential skills needed in future. Read it. 5) Make the list of great people of the world. Their qualities. Their achievements. Read it. 6) Make the list of the people who need your help. How can you help them . Read it. 7) Make the list of places you want to travel. Read it. 8) Make the list of the benefits of various exercises. Read it. 9) Make the list of negative people in your life. Read it. 10) Make the list of things that improve your mood. Read it. 11) Loudly read the list of things you are thankful for. Expresses gratitude towards god. 12) Loudly read the list of your achievements. Remind yourself of your progress all day. 13) Loudly read the list of your dreams. Keep repeating all day. 14) Loudly read the list of skills you want to learn. Remind yourself all day. Start learning. 15) Loudly read the list of great people. Keep remembering. Think about their qualities which you also have. How can you develop those qualities which you don’t have. 16) Loudly read the list of the people who need your help. Read many times. Start helping people. 17) Loudly read the list of places you want to travel. Read it many times. Try going to some places. 18) Loudly read the list of the benefits of exercises. Start doing some exercises. 19) Loudly read the list of negative people in your life. Resolve not to talk to them. Seek company of people who uplift you. 20) Loudly read the list of things that improve your mood. Decide to do some of them when you feel down, for example- listening to music, dancing, walking, running, talking to old friend etc. No Comment to " Personal Training Program for All Time Happiness within 30 Days "